Why buy a mobility scooter storage shed from us? Our flooring is more than strong enough for even the heaviest mobilty scooter (and rider! ), and buying the tanalised option will mean it's maintenance free! The ramp allows the scooter to be driven into storage, the double doors, and size of the mobility scooter shed allows the rider room to dismount easily! 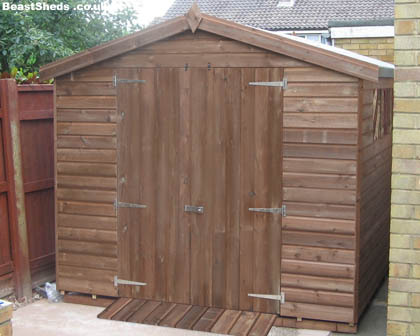 Of course you can opt for a smaller shed and push your vehicle in, the choice is yours! 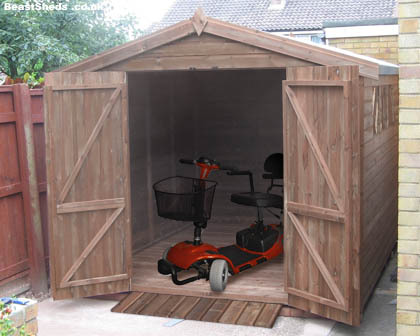 On checkout tell us you're buying the shed to store a mobility scooter and we will provide a free wooden ramp (similar as shown in the photos above). Electric scooters require charging up, get an electrician to install power points inside your storage shed, you might also want to have a small fuse box set up as a safety precaution. For added convenience have some interior lighting installed, and have a security light put on above the doors so you can see your approach and obviously provide security.